Saperavi is a grapevine variety known mainly in Georgia - where it is the most commonly planted red grapevine variety. Most Georgians are probably not aware of the fact, that their national treasure is planted also in other regions of the wine world. So, Mr. Alexander Kaffka, the head behind the website Hvino News, and his team had the idea to organize the Saperavi World Prize competition. Hvino News is a website which usually informs the world on regular base about Georgian wine news in English and Russian. 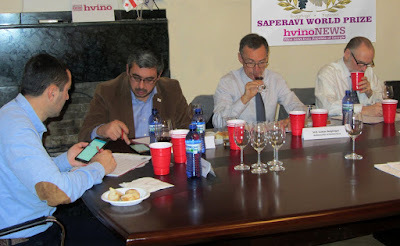 Saperavi wine producers from all over the world were informed about the competition and sent their samples to Tbilisi. The date for tasting and judging the wines was set on December 15th. The jury met at ICC – International Chamber of Commerce, which kindly provided rooms, at 10:30 hours. While bottles, covered with brown paper bags, were opened jury members had time to accommodate and get to know each other. Tasting started at 11 o’clock. Jury members sat along a big, dark wooden table, where all the wrapped and numbered bottles were standing in a line. Everybody had a name sign, a pile of scoring sheets in front of them, three wine glasses, bread and water to neutralize and rinse the mouth. The jury consisted of Mr. Kakha Tchotiasvili, Tchotiashvili family vineyards, Mr. Andro Barnovi, Georgian Federation of Artisan Wine, H.E. Lukas Beglinger, the Ambassador of Switzerland in Georgia, Mr. Paul Rodzianko, JSC Cradle of Wine, Mr. Berthold Seitz, German wine expert, H.E. William Lahue, Head of the NATO Liaison Office in Georgia, and Ms. Ute Seitz, German wine expert. Mr Seitz took over the chairman position and explained the modalities of the scoring and completion of the scoring sheets. 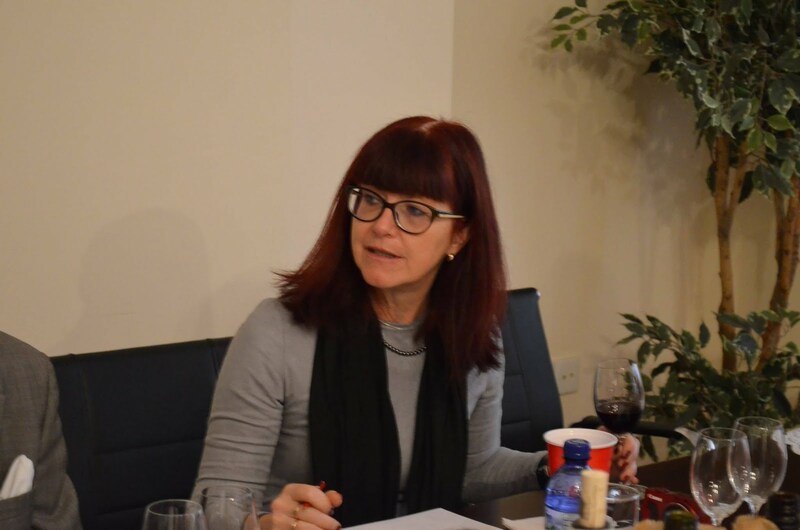 Deep dark red wines were filled into the glasses and judged by their clarity and colour aspect, their genuineness, intensity and quality of the nose and their genuineness, intensity, persistence and quality of the taste. Additionally an overall judgement of the wines quality had to be made to reach the full amount of points for each wine. It was amazing to taste such a variety of Saperavi wines in such a short time. Some very good qualities, oak matured, with nice vanilla flavours, full bodied with good alcohol structure. As usual, not all wines were appreciated by the jury, and most scores ranged in the average range. After every sample Mr. Seitz collected and signed the scoring sheets and announced the scores which were given by the judges. The highest and the lowest scores were taken off and from the remaining scores the average was calculated to find the result for each wine. Wines came from Australia (14 wines), United States (4 wines), Azerbaijan (3 samples), Kazakhstan (2 samples), Russia (2 samples) and one wine each from Armenia and New Zealand. Results are to be announced at a special ceremony.